第146期 活动 – (英语)讲座|波鸿 – 寻找穿越国境的“中国因素“，一个中国国际新闻记者的视角 | Rhine Academic Forum e.V. – Event no. 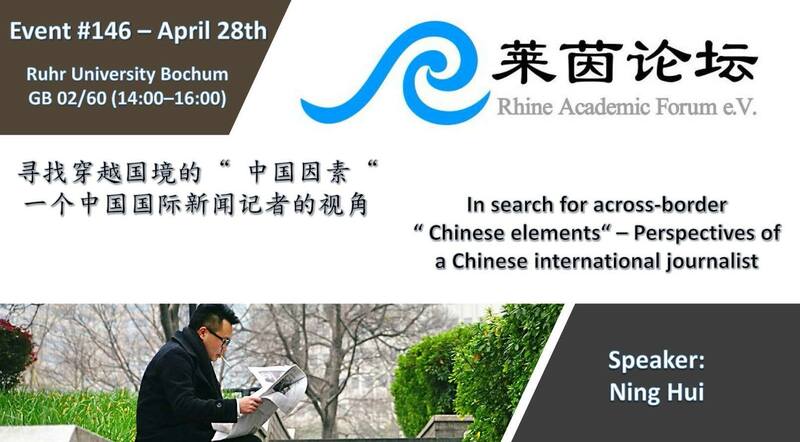 146 (in English): In search for across-border “Chinese elements” – Perspectives of a Chinese international journalist – Rhine Academic Forum e.V. Introduction: China, along with its fast-growing economic performance, the increasing emergence of global economic integration and dynamic politics, has been one of the internationally most discussed topics in the early 21st century. As such it gradually becomes a virtually omnipresent main narrative within the media landscape. The international community is actively trying to deepen and improve its understanding of China in many ways. We’re frequently offered a variety of perspectives, yet they appear to be either starkly pro- or anti-China. This can, due to numerous reasons, including the polarized media discourse, various beliefs or stakes of audiences, cause situations, which are hard to understand. Ning Hui, our speaker, who has been actively reporting from a dozen of different countries since 2013, finds this simple juxtaposition of happenings inappropriate. The way of understanding shall not be one-sided. Understanding China includes grasping knowledge on how things are understood, communicated, and transferred within China itself and between people in-/outside of China. In this case, her approach includes not only people well known in media, but also those voices, which we might not often heard without any in-depth reporting. For a better understanding, she tries to get perspectives outside of that stark juxtaposition of one-sided narratives. Her encounters, to name a few, include MEPs in EU, a prominent European philosopher (Slovej Zizek), Chinese shop owners in Congo, a Mozambique government Minister, an Ukrainian war veteran, researchers and NGOs, Chinese timber traders and construction companies, and Sudanese refugees in the jungle of Calais. As an experienced journalist, she will present us her stories from across European, Asian, and African borders, with a focus of Chinese elements in the everchanging geo-political world. Central questions include: “How do Chinese communities function in the Congo Basin and Mozambique?”, “Does the multi-billion ‘One Belt and One Road’-program of the government of China converge community, economies and political aspirations across countries?”, “How are the current European headlines discussed across Chinese readers?” After the presentation, there will be some time for Q&A to further certain topics and/or exchange between our audience and Ning Hui. About the speaker: Ning Hui 宁卉, to some known as Lulu, was born and raised in a small village in mainland China. She’s currently based in Brussels, working for the well-known media “Initium” (Hong Kong). Given her educational experiences within multidisciplinary studies in mainland China, Hong Kong, the Netherlands, and the UK on politics, journalism and public policy, as well as several years’ experiences of being a journalist working with international media, in addition to her working experience at international organizations, including the UN Women and Oxfam, she has gained ample observation from both inside and outside China. Her education focused on politics, journalism, and public policy (development and governance). She’s currently Senior Journalist for International News at Initium Media, before that she was working as Chief Europe Reporter for Globus, Caixin Media. Ms. Ning has covered a broad range of topics: incl. refugees, migration, populism, gender, poverty, climate change, among others. The Rhine Academic Forum e.V. welcomes everyone who is interested in this topic to join our 146th event on Saturday, the 28th of April 2018. We are looking forward to seeing you soon! ← 莱茵论坛 第145期 活动- 讲座|波鸿 – 煤炭资源枯竭城市的转型及其治理 – 山西 | Rhine Academic Forum e.V. – Event no. 145: The transformation of coal-based resource-exhausted cities and their governance in China – The case of Xiaoyi city, Shanxi province.